King Arthur: Legend of the Sword is a 2017 Australian-American epic experience dramatization film directed by Guy Ritchie and written by Joby Harold. 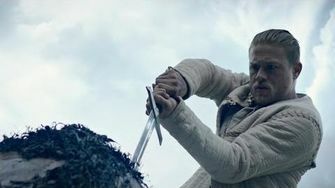 The film stars Charlie Hunnam as King Arthur. It is booked to be discharged on May 12, 2017, in 3-D and ordinary formats. The child Arthur runs the back boulevards of Londinium with his group, not knowing his royal lineage until he draws the sword Excalibur from the stone. In a split second stood up to by the sword's impact, Arthur is compelled to choose where to wind up distinctly required with his energy. Throwing in with the Resistance and a baffling young lady named Guinevere, he should figure out how to ace the sword, confront down his evil presences and join the general population to crush the despot Vortigern — who killed his folks and stole his crown — and to be the king.